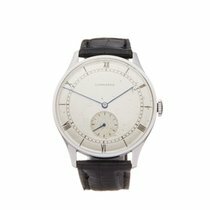 This is a pre-owned Longines Vintage gents 7984.1 watch. 34mm case size in stainless steel, Midnight Blue roman dial on a black leather bracelet, powered by a mechanical wind movement. This Longines is in excellent condition complete with box only. Circa 1960's. Our Xupes reference is COM1917 should you need to quote this.